From years of experience we understand what ARCHICAD User Tech Support is about and how very important it is for our clients, existing and new. to Get un-stuck when you need it the most ie. to meet deadlines or the get your project documentation to meet your requirements. to Do more in less time with ARCHICAD. Elevate levels of productivity by Improving your workflows and skill levels. to Do new exciting things - or old things in new and better ways. to Automate / semi-automate time consuming repatative workflows for you. to Focus on the design and specification of your project. There is no need for you to struggle. We can help you to get on with your work and get more from your ARCHICAD. Valid from 1 Nov 2016 to 30 Nov 2016. ARCHICAD 20 & iMAC Year End 2016, i.e. you will not be receiving the supportBIM60 (1 hour) on top of the supportBIM120 (2 hours), if you purchase that promotion. 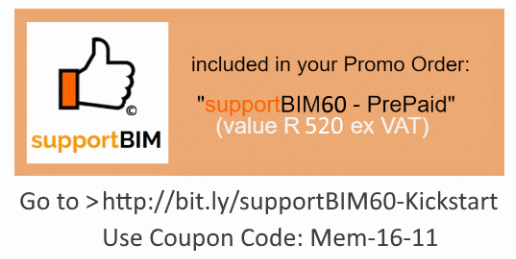 You receive the supportBIM60 per each successful membership application. Companies may only apply once.